Amit (Gogna) called me up today to say that Prof. Negroponte will be coming to India in the 1st week of August and that Reliance Communications (ADAG) will be setting up video conferencing around the country on matters of the little green laptop. He has asked me to send him a list of names of the people who can make a difference with the OLPC project in this part of the country. I’m looking forward to the event to see where OLPC goes from here on. On a related note, yesterday Kushal had punched in the panic buttons saying the Bijra School’s LTSP system was not working, so I had asked Subhodip and Arindam to do a site visit today and fix the problem. They reported back that it was a dusty and loosely seated RAM problem on the server, which they managed to fix. Which reminds me that we need to hold a fresh re-orientation workshop at the school soon. For quite some time now, we have been working on a project called “Nije Shikhi” (নিজে শিখি. It has been something very close to our heart, not just because we developed the concept, worked on bringing different technology and content together on one platform, but rather for the potential we see in it in terms of helping to bridge the digital chasm. The project targets 6 - 15 year old youth, including both in-school as well as those outside the school system, by creating edutainment kiosks using local language desktops based on open source and utilizing open-access / commons content. A critical factor in the project involves placement of the kiosks in an openly accessible place in the local community when the target group can access the units without requiring adult supervision. The project envisions being a key enabler in terms of the e-governance readiness among the masses, specially the youth. To empower them to become early adoptors towards the goal of creating an inclusive, knowledge driven society. The project has been taken up for deployment by the West Bengal University of Technology, which plans to set up ~ 500 - 600 units of Nije Shikhi kiosks, with the option of using solar-generated power, in collaboration with West Bengal Renewable Energy Development Agency (WBREDA). The initial pilot phase goes into putting 22 of these boxes out into the open. One of these pilot deployments is happening in collaboration with UNESCO and an NGO in West Bengal. 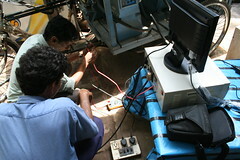 This involves a solar-powered, mobile tele-centre using the AMD UVC platform and our Nije Shikhi software stack. 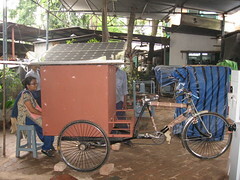 The tricycle van with the solar panel is now ready. The journey of the UVC is just about to begin. More pictures from our experimentation are here. So, buckle up, the journey is about to begin. The first lot of 22 nos. AMD Ultra Value Clients (UVC), branded Protos PC, which we ordered from Wipro were all delivered in a black painted enclosure. However, I’m less than happy with the choice of color for a few reasons. I’m sure that the matte black finish look would fit nicely on a desktop, however IMHO, the UVC is far better suited in info-kiosks and similar deployments. And that’s precisely why the choice of color black is worrying me. One of the USPs of this box is that it can work in non-a/c environments. Think about it… outdoors, hot summers and a black enclosure… perfect partners for getting over-heated fast. The paint job also leaves much to be desired as it smudges and scratches rather easily. FWIW, the lime green test unit originally given to me by AMD ran a bit cooler in hot weather and didn’t quite scratch so easily. Come to think of it, I have carried it around the country for more than 6 months, literally packed in with a bunch of other hardware and junk in my backpack, without a single scratch. Coincidence? Nah! I don’t think so? What say Wipro? Having some free time today, I decided to take the Classmate PC for a spin. The sample doesn’t have the provision for an optical drive. So the only way to install an operating system would be over a network using the PXE -> tftpboot approach. This would require taking the rather destructive step of removing the Windows XP Professional SP2 as shipped pre-loaded on the 2GB uDOC (formerly known as uDiskOnChip). Rather than take the route without clearing this with the Intel people, I decided to take the middle way and boot it to LTSP. The booting was nice and fast. No tweaks from my end. There was one glitch though, the video card couldn’t be detected by the autoprobe, so it fail-overed into VESA. Although I suspect this may not be the case with an up-to-date distro. One trick that I had to resort to was to set the taskbar/panel in auto-hide mode. Otherwise, some of the dialog boxes are kind of unusable. I took a few pictures. More on the UMPC coming shortly. Stay tuned! At a price point of US$ 430 in volumes of 200 units, the Porient H9 UMPC looks interesting! It’s powered by a 520MHz Intel PXA270 processor, 128 MB RAM, a 20 GB HDD and comes with a 7-inch TFT touch screen (800 x 480), integrated GPS, Wi-Fi, GPRS/CDMA connectivity, and PCMCIA and SD card slot. 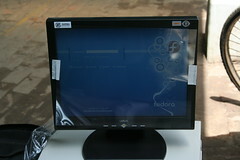 The video of the product from CeBIT 2007 is here. The other thing that caught my interest is that it runs off 5V DC at 2A… now *that* is something very, very nice! You are currently browsing the archives for the UMPC category.